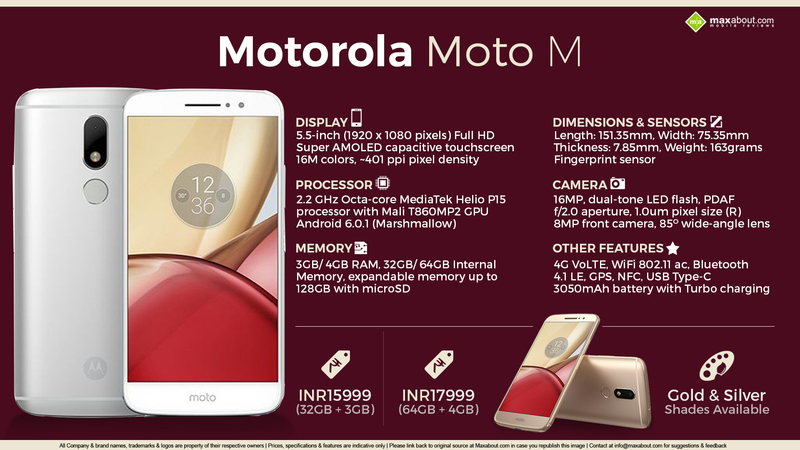 Motorola has officially launched the new Moto M in India at INR 15,999. The phone comes embedded in metal body, carrying impressive specs like Dolby Atmos audio and fingerprint sensor at the back. Moto M uses a 5.5 inch, full HD Super AMOLED touchscreen and runs on Android Marshmallow. It comes with 2.2 GHz Octa Core Mediatek Helio P15 processor, paired to 3 GB of RAM and 32 GB of internal storage. You can even get the better equipped version with 4 GB of RAM and 64 GB of internal storage at INR 17.999. The hybrid dual SIM phone uses 16 MP primary camera with dual tone flash, PDAF and 1.0um pixel size while the front is 8 MP with wide angle lens, 1.12 um pixel size. Other important features include 4G VoLTE support, GPS, NFC, USB Type C connectivity and 3050 mAh battery with turbo charging. The phone support 3.5 mm audio jack for voice output and supports storage extension through the hybrid slot. Apart from the RAM and storage, everything remains the same in both the Moto M models. The phone is exclusively available through Flipkart, currently being sold in Gold and Silver shade only. Moto M also carries few launch offers like INR 1000 off when bought from Citi Bank Credit Cards, INR 2000 bonus on old phone exchange, Moto Pulse 2 headset for INR 499 and EMI from INR 776 only. You can buy the phone from Flipkart here.